the UK as a Coupé or Spyder since September, and first deliveries of UK examples, which are all built almost exclusively by hand at the Böllinger Höfe Audi Sport facility, will commence in March. Inside, the driver and passenger sit in heated sport seats covered in leather and Alcantara. Bucket seats upholstered in rotor grey or black perforated Fine Nappa leather are also available as an option. As another visual identifier, the dashboard bears an emblem “1 of 999” indicating the limited number of units. 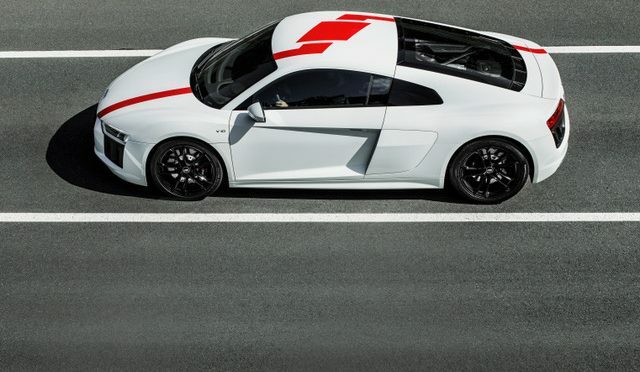 The Audi R8 V10 RWS is fitted as standard with black-finished, 19-inch, cast aluminium wheels in a five-spoke V-design that are exclusive to the model, with 245/35 tyres up front and 295/35 at the rear. As an alternative, optional 20-inch forged aluminium alloy wheels in either matt titanium or gloss anthracite black are shod with 245/30 front tyres and 305/30 rears. Neckarsulm, September 11, 2017 – Audi Sport GmbH is extending its R8 model series to include new derivatives with rear-wheel drive. 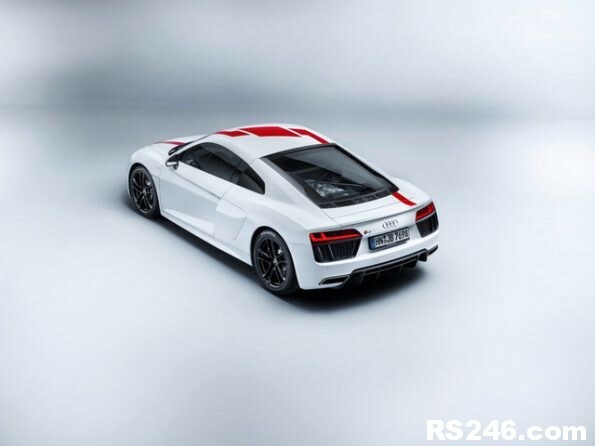 Limited to 999 units worldwide, and available to order in the UK from Friday September 15 priced from £110,000 OTR, the Audi R8 V10 RWS and R8 Spyder V10 RWS will be exclusively rear-driven (Rear Wheel Series) and will be built by hand at the Böllinger Höfe R8 factory. The purebred character of the new R8 variant is underscored by the matt black grille of the Singleframe and the matt black air apertures at the front and rear of the car. The upper sideblade (of the Coupé) is finished in gloss black, the lower blade in the body colour. 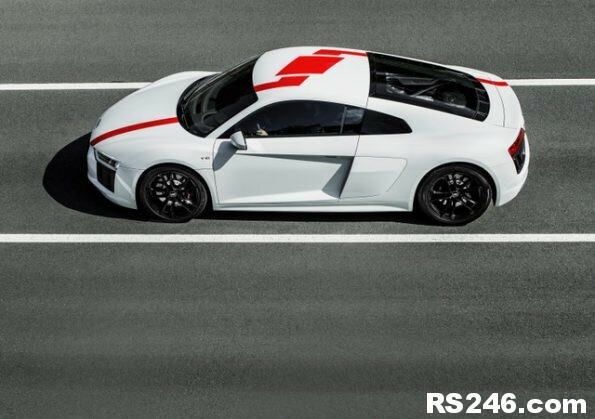 Similar to the R8 LMS GT 4, the Coupé is available with an optional red film running over the bonnet, roof and rear end. Inside, the driver and passenger sit in sport seats covered in leather and Alcantara. Bucket seats are available as an option. The dashboard bears an emblem “1 of 999,” indicating the limited number of units. The mid-mounted V10 engine of the Audi R8 V10 RWS produces 540PS. It delivers its peak torque of 540 Nm (398.3 lb-ft) at 6,500 rpm. The 5.2 FSI engine powers the Coupé from 0 to 62mph in 3.7 seconds (Spyder: 3.8 seconds) and beyond to a top speed of 198mph (Spyder: 197mph). 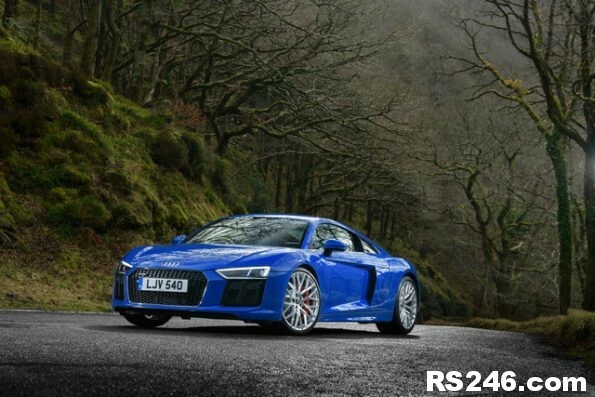 With the top closed, combined fuel economy in the R8 V10 RWS amounts to 22.7mpg, corresponding to 283 grams CO2 per kilometre. With the top open, these figures are 22.4mpg and 286 grams CO2 per kilometre. The Coupé weighs 1,590 kilograms (without driver), 50 kilograms (110.2 lb) less than the R8 Coupé with all-wheel drive which needs additional components like propshaft, multi-plate clutch and centre differential. The Spyder is 40 kilograms lighter than the R8 Spyder V10, weighing in at 1,680 kilograms (without driver). The axle load distribution of 40.6:59.4 (Coupé) and 40.4:59.6 (Spyder) together with chassis and handling tuning specially adapted for rear-wheel drive provide for particularly entertaining driving. The chassis setup and control systems allow controlled drifts if the driver chooses “dynamic” mode in the standard Audi drive select dynamic handling system and sets the Stabilisation Control ESC to “Sport”. The ESC intervenes reliably at the limit. The electromechanical power steering is completely free of torque steer and enables precise handling. 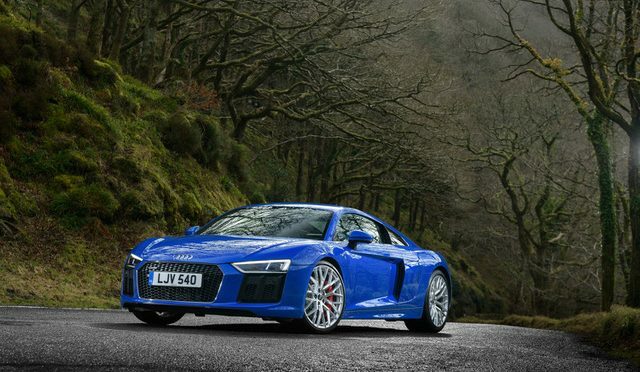 The Audi R8 V10 RWS is fitted as standard with black-finished, 19-inch, cast aluminium wheels in a five-spoke V-design, with 245/35 tyres up front and 295/35 at the rear. 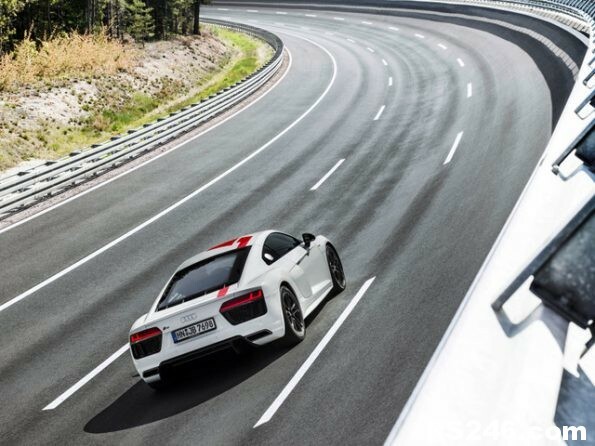 The most powerful Audi engine ever destined for series production is about to raise the tempo in what is already one of the most intoxicating driving machines offered by the brand – the open-air, high intensity R8 Spyder is to adopt the gloriously vocal 610PS V10 from the R8 V10 plus Coupé. The new R8 Spyder V10 plus is capable of 0-62mph in a mere 3.3 seconds and a top speed in excess of 200mph, spurred on by its significant 70PS power advantage, and by a significant 25kg weight reduction, versus the ‘standard’ V10 Spyder. 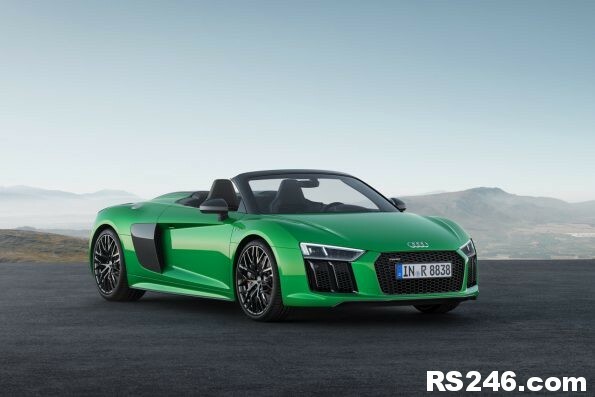 Set to become available to order in the UK later this month, the R8 Spyder V10 plus will be priced from £147,470 OTR, and will feature a standard specification list that reflects the sporting credentials and premium positioning of this high-performance flagship. Highlights include R8 bucket seats, liberally applied carbon fibre-reinforced polymer components inside and out, ceramic brakes, the R8-specific Audi Virtual Cockpit and the option of an exclusive micrommata green paint finish for an even more cutting-edge look. Incredibly high revving up to 8,700 rpm, and offering lightning-quick response coupled with an evocative, voluminous sound, the top V10 with its 610PS and maximum torque of 560 Nm is the most powerful series-production engine from the brand with the four rings. 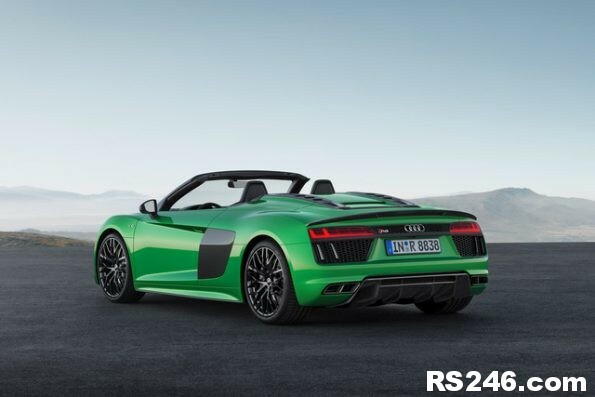 Compared with the Audi R8 Spyder V10, the naturally aspirated 5.2 FSI engine, with a high 12.7:1 compression ratio in the plus version, features a 70PS boost in power and a 20Nm torque advantage. As a result, the top model sprints to 62mph in 3.3 seconds – 0.3 seconds faster – and achieves a top speed of 203mph, an increase of 6mph. In the NEDC, the R8 Spyder V10 plus returns up to 22.6mpg combined, which corresponds to CO2 emissions of 292 grams per km. Its efficiency technologies include the cylinder on demand (COD) system, which deactivates one cylinder bank at low to medium loads, as well as dual injection in the intake manifold and combustion chambers. 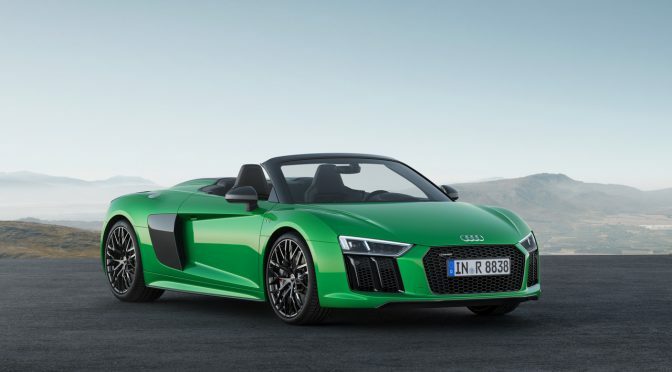 If the driver eases off the accelerator at a speed of over 34mph, the engine disconnects from the drive and the new R8 Spyder coasts at idle with minimal fuel consumption. When the car comes to a stop, a start-stop system deactivates the V10 engine. The oil supply is designed according to the dry sump principle, like that of a racing car. This enables the engine to be positioned extremely low, giving the car an extremely low centre of gravity – a requirement for the sporty and agile driving behaviour. 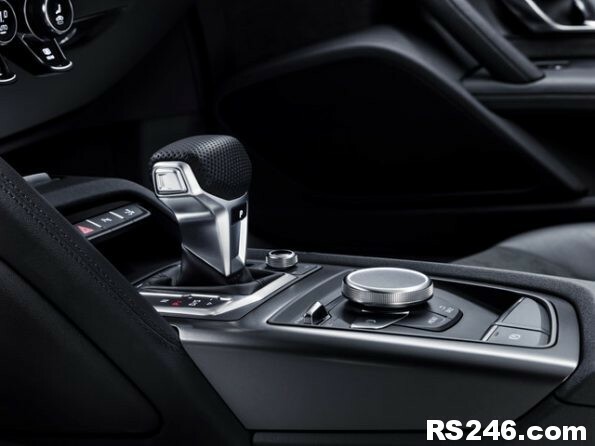 Management of the clutch is integrated in the Audi drive select dynamic driving system, which gives the driver a choice between Comfort, Auto, Dynamic and Individual modes. The standard performance mode includes the programmes dry, wet and snow. They adapt the characteristics of the drive system and suspension to the friction coefficient of the road. As well as control of the quattro drive system, Audi drive select can also influence the operating characteristics of the accelerator pedal, the seven-speed S tronic, the steering, the flaps of the exhaust system and the optional Audi magnetic ride adaptive damper control, which uses a synthetic oil with small magnetic particles to vary damping in auto, comfort and dynamic modes. In dynamic mode, the system delivers the sharpest possible steering response and maximum handling agility. The wheels are precisely braced during cornering and body roll is largely suppressed. During braking, Audi magnetic ride counteracts the tendency of the body to dip. The performance programs from Audi drive select also make use of Electronic Stabilisation Control (ESC) for the best possible lap times. All four wheels of the Audi R8 Spyder V10 plus are guided through aluminium double wishbone suspension, demonstrating the model line’s close links with motorsport. The setup is firm and the electromechanical power steering offers the ideal specific combination of precision, handling and confident high-speed behaviour for a sports car. Dynamic steering with variable steering ratio is available as an option. This boosts the car’s responsiveness at all speeds, providing high-performance cornering characteristics and quick steering behaviour. It countersteers with tiny impulses at the cornering limit to further improve stability. Audi mounts a mix of tyres – 245/35 on the front, 295/35 on the back – on the standard 19-inch forged aluminium wheels in five twin-spoke design. The optional 20-inch wheels are shod with 245/30 and 305/30 tyres. The large brake discs – 380mm diameter upfront and 356mm on the back – are manufactured from extremely durable, temperature-resistant and lightweight carbon fibre ceramic composite. The anthracite grey fixed calipers feature six pistons on the front axle and four in the rear. The R8 Spyder V10 plus has an athletic stance on the road. It is 4.43 metres long and 1.94 metres wide, but just 1.24 metres tall. The most distinctive element on the front is the wide and flat Singleframe grille with its gloss honeycomb mesh, chrome-plated frame and the Audi Sport emblem. Below it stretches a low-lying carbon spoiler, which directs air around the large wheels. Optional Audi laser light in the LED headlights provides farsighted vision at night. These feature distinctive illuminated, anodised blue dividers as well as the dynamic turn signals. Typically Audi: the exterior skin of the cloth top is fabric, the substructure is primarily made from lightweight materials like magnesium and aluminium. Consequently, the cloth top weighs just 44 kilograms and contributes significantly to the low weight and low centre of gravity of the R8 Spyder V10 plus. Two fins running to the rear tighten the top. An electrohydraulic drive takes 20 seconds to open or close the top, even while driving at speeds up to 31mph. Folded in a Z-shape, it is housed in a flat storage compartment over the engine. The rear window is sunk into the bulkhead and can be retracted and extended electrically. With all of the windows closed and the optional wind deflector installed, the wind passes gently over the driver and passenger. Two steel sections pretensioned by springs in the convertible top module serve as roll-over protection. The multimaterial Audi Space Frame forms the strong backbone of the R8 Spyder V10 plus. It combines components made from aluminium and structurally integrated carbon fibre-reinforced polymer (CFRP). This is decisive for the low weight of the open-top high-performance sports car. Empty and without a driver, it weighs only 1,695 kilograms; dry weight is just 1,587 kilograms – another 25 kilograms less than the Audi R8 Spyder V10. The lower weight is achieved, for one, with the R8 bucket seats, as well as with the carbon-ceramic brake system and the light-alloy forged wheels. The aluminium parts make up 79.6 percent of the weight and constitute a supporting structure that the engineers used especially to strengthen the sills, A-pillars and front windshield frame of the car in comparison with the R8 Coupé. The outer skin is likewise made primarily of aluminium. The centre tunnel, rear panel and B-pillars are made from extremely tough and torsion-resistant CFRP. In addition to the selection of materials, innovative manufacturing methods have also reduced the weight of many components. The Audi Space Frame weighs just 208 kilograms, while its torsion-resistance has increased more than 50 percent compared to the first R8 generation. This rigidity is the decisive parameter for driving precision, crash safety and acoustic comfort. With the Audi exclusive programme, the possibilities are almost limitless for customers to personalise their R8 Spyder V10 plus. In addition to the 11 regular paint finishes, the palette extends to freely selectable colours and matt-effect paint finishes. The convertible top is available in three colours, and the side blades can be selected in five colours. Like the door sill trim, the side blades can also be personalised with insignia as well as designed in colours according to customer tastes. In addition, parts in carbon or titanium black are available for many areas of the exterior and interior. Numerous upholstery types, inlays, and colours add to the wide range of options. The optional micrommata green design package lends the convertible high-performance sports car the ultimate edge. Its body is painted in a distinctive green. The anthracite grey Singleframe grille and black tailpipe covers create a sharp contrast. Audi exclusive furnishes the interior completely in black, in fine Nappa leather, which is perforated on control elements. Green contrast stitching accents the seats, centre armrests, doors and floor mats with luminous colour that matches the exterior. The standard equipment package for the R8 Spyder V10 plus includes a superb infotainment system – the MMI navigation plus with MMI touch. It features impressive and intuitive control logic with flat hierarchies. Added to this is a free text search that delivers suggested hits after only a few letters are typed in. The natural-language voice control function also recognises many terms from everyday speech. Standard seatbelt microphones provide for optimal audio quality, even when the top is down. In addition, the MMI navigation plus has an integrated Wi-Fi hotspot for the mobile devices of passengers. 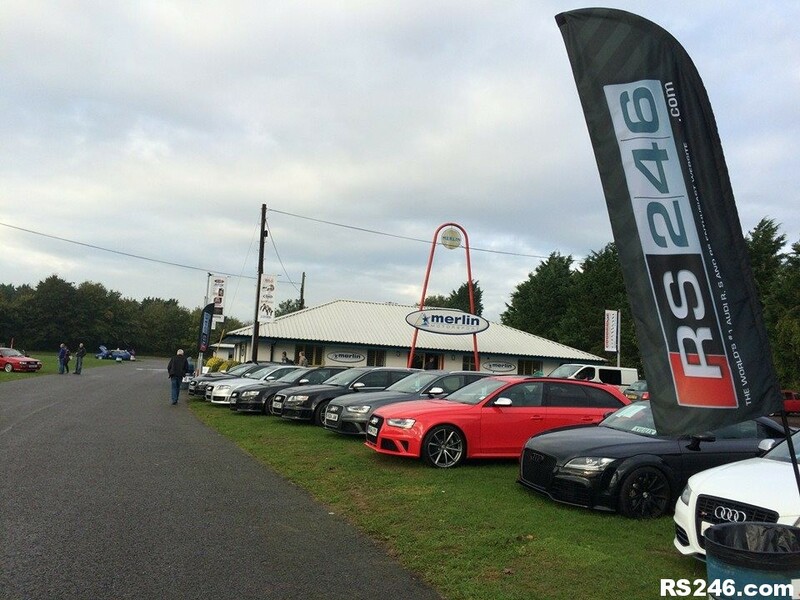 The quality of the R8 Spyder V10 plus fulfills the most stringent standards. The body and final assembly are completed in the “Audi Böllinger Höfe” production facility operated by Audi Sport near Neckarsulm. The processes are organised to be highly flexible so that individual customer requests can be fulfilled. About 500 highly qualified employees construct the cars by hand with meticulous care. Before they are delivered, each high-performance sports car is put through a stringent test procedure until their final test drive on public roads.